When you purchase my patterns, please be confident that each has been carefully tech edited and test knitted prior to release. However, the occasional mistake does slip past the team’s zealous attention to detail. When this happens, I will post an update below as soon as the error is caught. If you purchased a PDF pattern or ebook through Ravelry, you will receive an email with a link to the specific correction or to an updated version of the pattern. Although we try very hard to make sure there are no errors before going to press, we regret that we’re only human. Below are corrections. 4/4RC: Slip 4 Sts to cable needle, hold in back. Knit 4, knit 4 from cable needle. Rep last 2 rows once more – 150 (160, 170) sts. Beg short-rows as foll, slipping markers as you come to them. Row 3: *K1, p1; rep from * to end. Row 4: *P1, k1; rep from * to end. Rnd1: ***Sk2p**, knit to next marker…. *S2kp, knit # of sts indicated for your size, sl m; rep from * to end of rnd. K2, k2tog, k4, yo, k1, p2, k2tog, yo, p2, k1, yo, k4, sl 1, k1, psso, k2. ZEPHYR: In the YOKE instructions, p. 87, line 10, beginning with “more times,…”: the stitch count in the XS once the increases have been worked should be 154, not 152. 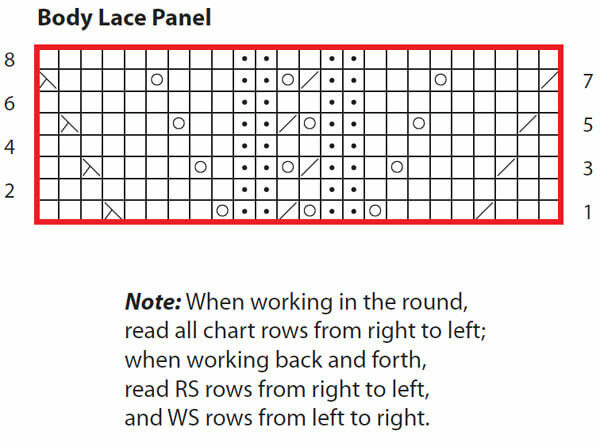 ZEPHYR Pattern Notes: The ‘skp‘ instruction in the Harebell Lace pattern in written row-by-row format is correct as written, but it was misinterpreted on the chart and the chart’s Stitch Key as ‘ssk.’ Both are left-slanting decreases, with slightly different appearances but no impact on the overall outcome of the lace panels. In the Stitch Key and on the chart (p. 89), please correct the ssk to skp throughout. Row 16: *K4, yo, k1, yo, k4, sl 1-ssk-psso, rep from * to end. Row 18: *K4, yo, k1, yo, k4, sl 1-ssk-psso, rep from * to end. TULIP PEASANT BLOUSE: Page 9: Error in the Sleeve Edging instructions: The Size XS knitted sample’s sleeve lace border includes 4 full repeats (at 18 sts x 4 = 72) plus 4 extra sts on either side of the underarm, where the motif is split on either side of the central yarnovers for a total of 8 extra stitches. This means that the sleeve lace border has a total of 80 stitches including the extra 8. The border in this size measures a total of 14 inches in circumference. As written in the book, the pattern includes only half of the actual stitches needed to cast on for the sleeve border lace. The correct number of CO sts for the sleeve lace borders should be: 80 (80, 82, 84, 84, 86, 88). Follow remaining directions as written. In addition, the lace repeats for the Neckline Lace Chart should be started at Row 1 for the Right side of the neckline, and should be started at Row 7 for the Left side of the neckline. This will give the Neckline Lace the mirror image appearance seen in the project photos. GLOBAL CABLE COAT: As has been posted on the comments on the pattern page for the Global Cable Coat, there is an error in round 11 of the cable panel line-by-line on page 27 (half way down the right-hand column on that page). The line should end with “p1”, not “p2.” This section should also tell you, immediately following “Cable Repeat” at the top of the right-hand column” that: The pattern repeat is 12 stitches. Please refer to the chart at the end of the pattern on Page 32, which gives this information. A reader recently brought the following to my attention: There is an error in the Krookus Chart 1A in line 55, rightmost cable shown as “C4 over 1R” should be “C4 over 2R” and stockinette between the cables should be 5 stitches instead of 6. Thank you, Laura! Rows 22 – 27: follow chart as for rows 68 – 73. This will give your cables their “legs” before you need to cross them. Sleeve cable should be every 10 rows. It is set up that way, but the chart shows 7 rows. Instructions for the C3Rp should be: Place 1 st on CN and hold in back, k2, p1 from CN. HYDRANGEA NECKWARMER: The decrease in Rnd 5 should be sk2p (sl 1 k2tog psso) in BOTH the chart and the written instructions. Climbing Vine Pattern: Note: At the start of Rounds 7 and 9, move the first stitch and the marker as indicated, shifting the start of these rnds by 1 stitch Round 1: *yo, k2, ssk, k3, k2tog, k2, yo, k1, rep from * to end of round. Round 2 and all even-numbered rounds: Knit. Round 3: *k1, yo, k2, ssk, k1, k2tog, k2, yo, k2, rep from * to end of round. Round 5: *k2, yo, k2, sl 1 k2tog psso, k2, yo, k3, rep from * to end of round. Round 7: (remove marker, k1 st to RH needle, replace marker), *(k1, yo) twice, k2, ssk, k3, k2tog, k1, rep from * to end of round. Round 9: (remove marker, k1 st to RH needle, replace marker), *yo, k3, yo, k2, ssk, k1, k2tog, k2, rep from * to end of round. Round 11: *k5, yo, k2, k3tog, k2, yo, rep from * to end of round. Round 12: Knit. HELIX SOCKS: In the SPECIAL STITCHES LT directions it should say, “Knit the first st on the Left hand needle…” (not left-and needle…)The Helix pattern has five rounds. After the Rnd 5 directions on Page 211 it says,”Rep Rnds 1-4 for 37 rnds.” It should say Rep rnds 1-5 for 37 rnds. SPROUTING CLOCHE: There is an error in Row 30, where K3 should be K5. In Row 40, the chart omits an extra purl stitch inside either end. You have to decrease additional stitches. Then complete the chart with 18 stitches plus the two selvage stitches, rather than 32 as the pattern states. Chart Rows 44 and 45 show 2 extra knit stitches in the middle that should not be there.